Morean Arts Center | Registration is open to find St. Pete’s Best Cupcake! Registration is open to find St. Pete’s Best Cupcake! 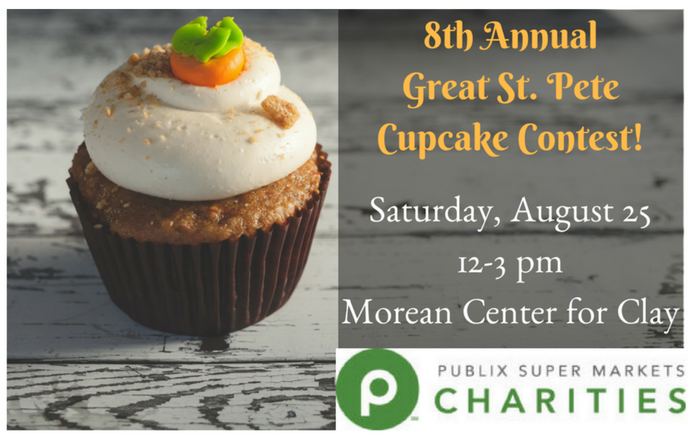 8th Annual Great St. Pete Cupcake Contest! The Morean Arts Center invites you to compete in a city-wide search for St. Petersburg’s BEST CUPCAKE! Whether you’re a novice, hobbyist or professional, we encourage all baking enthusiasts to enter this incredibly fun event. Cupcakes will be judged on icing/frosting, flavor/texture and presentation/creativity for a total of 50 points, which allows plenty of room for edible creativity. In addition to bragging rights and trophies, winners will enjoy fame and fortune as a celebrity on the Morean website, Facebook page and city-wide media! The contest will be hosted at the Morean Center for Clay located in the Warehouse Arts District at 420 22nd Street South – Saturday, August 25 from 12-3 p.m.